Internationally John Herbert Gleason (February 26, 1916 – June 24, 1987) was an American comedian, actor, writer, composer and conductor. Developing a style and characters from growing up in Brooklyn, New York, he was known for his brash visual and verbal comedy, exemplified by his bus driver Ralph Kramden character in the television series The Honeymooners. By filming the episodes with Electronicams, Gleason was later able to release the series in syndication, which increased its popularity over the years with new audiences. 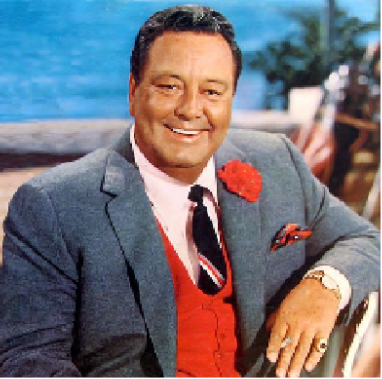 He also developed The Jackie Gleason Show, which maintained high ratings from the mid-1950s through 1970. After originating in New York City, filming moved to Miami, Florida, in 1964 after Gleason took up permanent residence there. Throughout the 1950s and 1960s Gleason enjoyed a prominent secondary music career, producing a series of best-selling "mood music" albums. His first album, Music for Lovers Only, still holds the record for the longest stay on the Billboard Top Ten Charts (153 weeks), and his first 10 albums sold over a million copies each. To date his output spans some 20-plus singles, nearly 60 long-playing record albums, and over 40 CDs.